Chances are, you’ll find yourself at some kind of big-venue music show this summer, whether it's Radiohead at an outdoor festival or Fiona Apple at an intimate, medium-sized music hall. We’ve all been there. We expect to be dazzled (or dizzied, or blinded) by the light show, and rumbled deep in our guts by the subwoofers. The people who produce rock concerts are always looking for new ways to thrill and surprise us, and they’re increasingly turning to technology to do it. Here’s how some of the major components of the “big show” work. To you and me, the star of the show is usually the singer onstage, but the most important person at a rock show is really the sound engineer who mixes the live audio. As former house big-concert mixing engineer Jon Graves tells me, the mixing engineer makes very good money, gets some star treatment on tour, often has a bit of an ego, and tends to bark orders to the other engineers and techs around him. The mixing engineer is the guy who sits at a small booth “at the front of the house” (facing the middle of the stage from the floor in the center of the venue) in front of the huge mixing board. He controls and mixes all of the sounds coming from the stage—every piece of sound-creating equipment onstage and in the production booth runs through the main board, which is often big enough to handle more than 100 tracks. At the mixing board, the engineer has all the instruments laid out on separate tracks. The 12 microphones placed around the drum kit, for instance, might use tracks 1 through 12 on the mixing board. Once all the instruments are mapped to a track, the engineer can then meticulously mix a live sound that is perfect for the venue. But that’s just the mix that the audience hears. The musicians on the stage need a completely different mix so that they can hear their own sounds in the context of the sounds that their fellow musicians are making. Creating such a mix is a big job, so a separate engineer with a dedicated (monitor) mixing board is installed at the side of the stage. A pair of Shure in-ear monitors. Graves tells me that the onstage monitor mix used to issue from a set of wedge-shaped speakers on the stage, pointed up at the musicians. But these days, many performers wear wireless in-ear monitors, which present their own challenges for the engineer. The monitor engineer, Graves explains, can be required to create as many as 15 different stereo mixes—complete with effects—to match the monitoring taste of each individual musician. The usual scenario is that some of the musicians will prefer a stage monitor mix, while others will prefer an in-ear headphone mix, and still others will prefer a mix combining both. Take the case of Sleigh Bells, the Brooklyn-based two-person act that appeared on Saturday Night Live recently. Sleigh Bells has no drummer or bass player—just a female vocalist (Alexis Krauss) and a single guitarist (Derek Miller). The backing vocal parts, beats, bass, synth patches, and samples in the live set are all preprogrammed in a digital audio workstation (DAW) software product called Ableton Live. 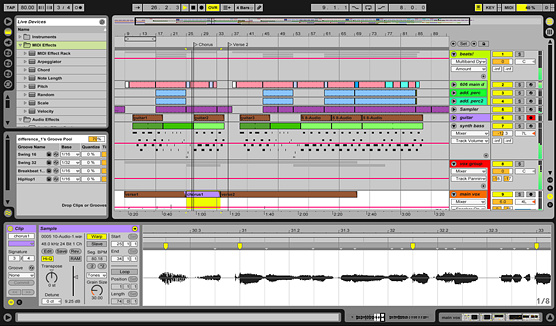 An arrangement in Ableton Live. Miller writes and records many of the beats and guitar loops on a laptop running Ableton Live, and Krauss performs the backing tracks and vocal loops that crop up in many Sleigh Bells songs. For live shows, an offstage engineer plays the backing tracks on a computer running Ableton Live. Krauss and Miller prefer not to wear in-ear monitors onstage, relying on (very loud) onstage monitors to hear the mix. Many musicians, especially drummers, must wear in-ear monitors that play the backing tracks. The drummer, in fact, is sometimes the person who decides when the next backing-tracks “song” will start. At Sleigh Bells shows, an engineer at the side of the stage watches the show closely and starts the song in Ableton Live at the correct moment. But some other musicians can start the tracks from the stage using a foot pedal that triggers the audio software. In Sleigh Bells’ case, the backing tracks are run from offstage, but more and more musicians are hauling their laptops onstage to do all kinds of things. Many keyboardists run Logic or Ableton on their laptops, and trigger patches from the software libraries using a MIDI controller (a keyboard that generates no sound of its own but instead triggers sounds in other devices). Other musicians hate using laptops onstage (I’m one of them), preferring to trigger sounds from physical MIDI keyboard modules. The advantage of using DAW samples is that the library of sounds is much more easily expanded.